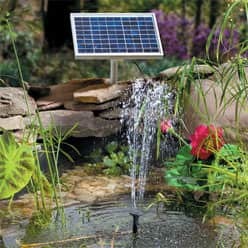 Fountain pumps for garden ponds come in two varieties: wired and solar. When building a new fountain or replacing an old pump, it is imperative that the correct pump be selected for best results. A pump that is too weak will move water very slowly or not at all. A pump which is too powerful is likely to spray water beyond the edges of the pond water, resulting in a water level drop. Flow rate, maximum flow height, and tube diameter are some of the prime features to examine. The same rules apply to choosing solar and wired pumps, but you will find that the solar varieties tend to be less powerful and designed for modest applications. 1) Determine how much water your pond holds. This can be done by filling it up with a defined amount of water, using your manufacturer spec sheet, or performing a rough calculation based on the dimensions. 2) You want to select a pump which can circulate 50% of the total water in the pond every hour. For example, if you have a 200 gallon pond, the pump should be able to cycle 100 gallons every hour. To determine the pump’s speed, simply refer to its GPH (gallons per hour) rating. Seek out a pump which roughly meets the required speed. 4) Select a location on the pond floor where the fountain pump will be completely submersed. If a portion of the pump is left exposed to the air, the pump can quickly burn out. Water serves to lubricate and cool the pump’s moving parts. After installation the water level of the pond should be kept above the pump at all times. Try to anticipate the direction of the water spray so that you do not lose too much over the edge of the pond. The closer the pump is to the water line, the more powerful the fountain stream will be. 5) Finish up by selecting a fountain spray nozzle of choice and routing the electrical cord near the rear of the pond. Cover the cord with various rocks and plant life so that it remains hidden from view. If the pump did not come with tubing and nozzles, users must purchase ones with the appropriate diameter to fit the pump. You will need a vertical shaft and an end nozzle. 1) Begin by disconnecting the power and removing any tubing from the pump. Take it out of the water and place it on a table. 2) Inspect the exterior housing for hair, algae and fish waste and remove it as necessary. A double sided sponge can help with this. 3) Remove the housing by unclipping it. A screwdriver may be needed to remove several key screws. 4) Locate the impeller and pull it out. If there is considerable lime scale, drop the impeller into a bowl of lime scale remover and let sit for at least 20 minutes. 5) Now that the impeller is removed, use a small brush to remove any internal gunk. Since water fountain pumps run under water, no lubrication is needed. 6) Replace the impeller and cover. Place the fountain pump back into the water to witness improved power and water flow. 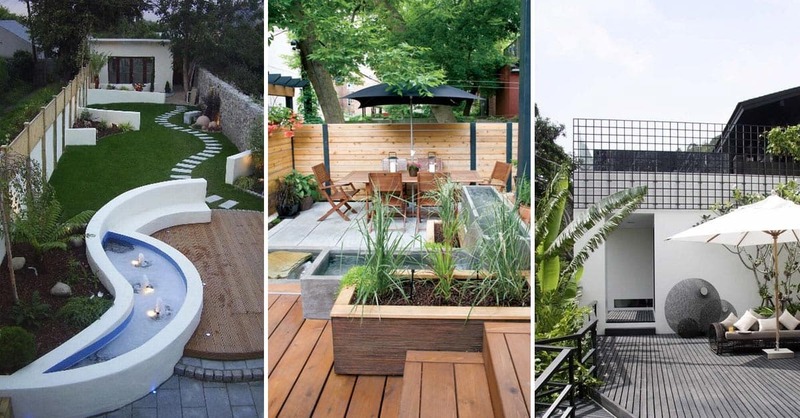 Learn how to build garden fountains. What is a solar water fountain? Return to Fountains and Ponds.